Happy Independence Day to my fellow American readers (and happy Sunday to those abroad)! Though I've taken some of this holiday weekend off, I have only done so preparing some of the great new features that will be debuting on Vertigo Shtick throughout the summer, so never fear: much more music, commentary and criticism is coming your way very shortly! In the meantime, I thought I'd try and help in case anyone else shares my unfortunate inability to watch any fireworks displays this evening, in a way that relates to one of my favorite things/areas of relative expertise: music, of course! (Also, musical theatre knowledge, close harmony, and anything obscure but appropriate.) I remember that every year for many years of my childhood my family would watch the wonderful film version of Meredith Willson's musical The Music Man, since much of it takes place around an Independence Day town celebration. 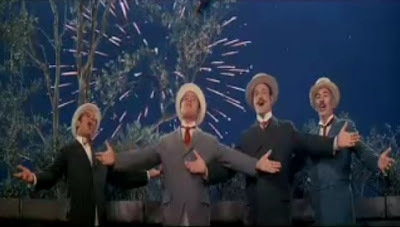 One of my favorite musical moments in the movies (the song was actually added for the film) has always been when the four quarelling members of the school board, whom lead character and swindling traveling salesman Harold Hill has by then turned into a barbershop quartet (in order to distract them from his shady doings), serenade the July Fourth revelers in the park with the song "Sincere," complete with fireworks that burst helpfully during the final chord. Imagine my delight when years later, in college, I went looking for a video of the scene and along the way discovered something even greater: some wonderful digital artist at one point inexplicably decided to recast the number as a computer-animated short film...with slugs. And the fireworks are even still present. Therefore, on this July 4, 2010, I "sincerely" wish you a happy holiday, by means of an invertebrate barbershop quartet...and fireworks. I think the fact that they have shells make them "Snails." Either way, this is a great animation.